Olentangy Berlin’s Jessica Nation works against Hayes’ Jordan Lantz during the first half of Tuesday’s showdown in Delaware. 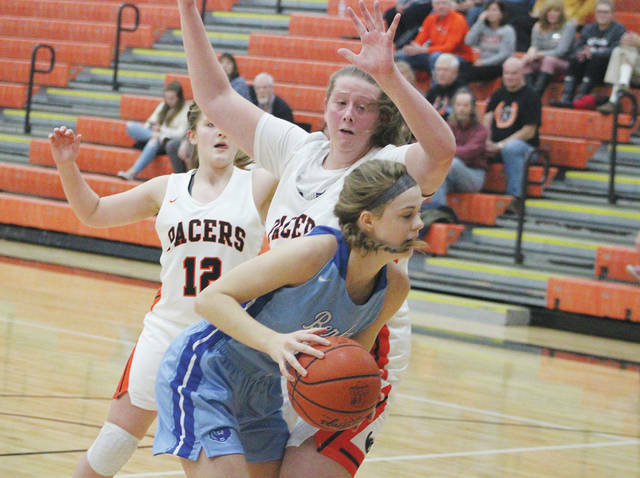 DELAWARE – Junior Jessica Nation scored all seven points in a 7-0 run to start the second half, helping the Olentangy Berlin girls basketball team create some separation on the way to its first ever win. Nation finished with a game-high 22 points, including 12 in the third quarter alone, in the Bears’ 58-46 win at Delaware Hayes in OCC-Cardinal play Tuesday night. It was a good come-back performance for Nation, who struggled in Berlin’s opener. She led the team in scoring, but struggled shooting from the floor. Maddie Goodman fed Nation underneath on the first two baskets of the second half. Nation added a free throw on the second basket to make it a three-point play. She scored her third basket in the run at the 6:10 mark to give the Bears (1-1, 1-1) a 32-23 lead – their largest to that point. Senior Piper Adkins led a mini-comeback for Hayes after a timeout. She assisted on a Jordan Lantz basket and knocked down two free throws. Lantz followed with a free throw to cut the deficit to 32-28 with 4:38 left in the third. The Pacers would never get closer than four the rest of the way. Goodman went a perfect 6-for-6 at the foul line in the final two minutes and change to put the game out of reach. Berlin took the lead midway through the second quarter on a Courtney Suchan three-pointer off a Meghan Boggess feed to give the Bears a 20-18 lead as part of a 10-1 run. Hayes closed the half with a 5-point spurt on baskets by Alyssa Griner and Lantz and a Lantz free throw to cut the deficit to 25-23 at the break. Freshman Chloe Jeffers was the highlight of the Hayes effort. She buried a three-pointer from just in front of the half-court line at the first-period buzzer to give the Pacers a 14-12 lead. Jeffers had 14 points on the strength of three threes and Lantz added 13 for the Pacers (3-1, 0-1). Both teams continue league play Friday night. Hayes hosts Hilliard Darby and Berlin welcomes Dublin Scioto. Both are scheduled to start at 7:30 p.m.